In the heart of Santa Fe, this modern home was built in 2011, but sits in the one-hundred-year-old south capital neighborhood! If you desire modern amenities and a well-appointed home, but with the authentic Santa Fe old world charm, look no further! This home is sure to please! Gorgeously constructed, this home has multiple features! The master suite is separated from the other two bedrooms and has its own private bathroom. Our beds are comfortable and dressed in luxury linens that allow for total relaxation. Experience Santa Fe in style. My place is close to the rail yard district, Farmer's Market, downtown historic Santa Fe plaza, Whole Foods, art and culture, state government buildings and several of our best restaurants. You’ll love my place because of its ambiance and the proximity to downtown! This home has been beautifully designed and constructed in the contemporary Santa Fe pueblo style! Gorgeous furniture makes this home super cozy. Bedrooms include a king size bed in the master suite plus one queen and one king size bed in the other two bedrooms. It’s a 5-minute walk to the state capitol, a 10-minute walk to the Railyard, and a 15-minute walk to the ever-popular downtown plaza! The open-floor concept makes the place feel spacious, making it a great space to entertain friends. 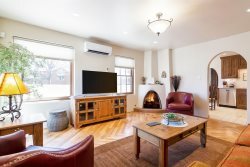 And no worries about Santa Fe’s hot summers, this home is equipped with four super-quiet mini-split air-conditioning units. This home is also equipped with a full-size washer and dryer. You will be able to enjoy the entire house and the outdoor space! The casita is occupied by a long-term tenant. · Pots, pans, cookware, blender, toaster etc.